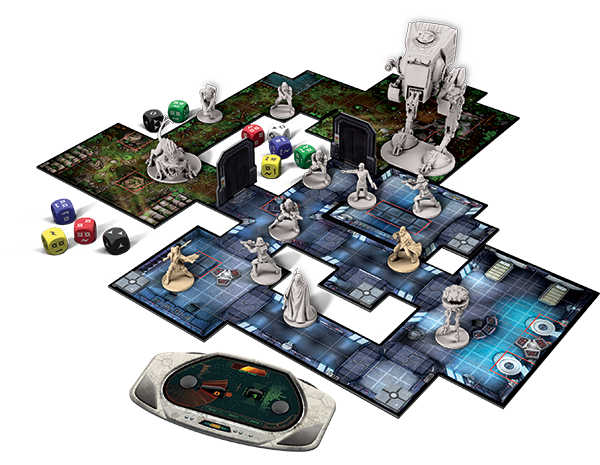 So, Star Wars: Imperial Assault hit every single geek button I have. Board game: check. Star Wars: check. Miniatures: check. Takes less time than Risk: check. I remember being in the game store, staring at the box for what must have been 5 minutes. My wife had to shake me from the daze. The downside was the price, nearly $120 smackers. Which is odd, because I had spent more earlier in the week on a single family dinner at a restaurant and this board game could be seen as an investment. So I did some research. Turns out, it’s more or less a skin-job on Descent 2nd edition, which I already own. Now, Descent is awesome but it’s competitive. Like the old Hero’s Quest games, or D&D, someone has to take the mantle of the bad guy. I don’t mind this aspect but for 2 players, with only myself as having any experience in this sort of stuff, it’s not terribly practical. A co-operative game means I can help the other team mates learn about the game and the meta strategies. So for now, SW:IA is on the backburner. So I kept looking around and 2 games were recommended, and both were Kickstarters. Shadows of Brimstone and Galaxy Defenders. Both were similar to Descent but were cooperative, so I bought both. Galaxy Defenders arrived rather quickly and my daughters and I set it up for a round. First off, having a 2 year-old and a 4 year-old help you remove punch-out cardboard items is a hoot. It’s like Christmas, when you get a couple packages with bubble wrap and kids go nuts. They were going crazy punching out these little tags (and not paying attention to where they landed) and were sad when there were none left. There were many pieces. It took about 20 minutes to sort it all out. Then another 20 to set up the first mission and quickly read the rules of engagement. My 2 yr old was done by this point, a little late in the night but my 4yr old was super keen to get playing. It was a “are we there yet?” night. Board is all set, I have the basic rules and we get going. I drastically simplified the strategic rules (there are like 8 major steps per turn, I went down to 2) and my daughter and I went full in. We each selected a random hero and started moving around the board. Aliens (always aliens) have a neat AI system dictated by the distance from players. Each side has some interesting quirks, related to dice rolls. There’s a basic hit, a crit, a gun jam, a reroll, defense and lost ammo to consider. Bonuses and penalties based on the rolls. Sometimes you get really lucky, sometimes things go really bad. We traded blows for about 30 minutes, allowing me to learn the flow of combat and her to practice her arithmetic. When you combine a dice roll, boosts, penalties, armor and subtract from hit points, I think that’s grade 10 math right there. We only stopped because she started nodding off between die rolls and she’s been talking about playing again ever since. Once the squirts were asleep and my wife was away doing some work, I decided to play the first mission solo, and play it proper. I took an hour or so to read all the manuals, line by line. I ran through a round in my head, then I decided to give it a shot. Sure enough, I missed a couple steps in the first few rounds but I eventually got the hand of it. I selected a tank character and a glass cannon to get through. The enemy scales based on player group size, so I wanted to keep it manageable. Things went well enough to start as there are goals to attempt to complete. The AI is there as a hurdle but not so much as punishment, so it isn’t like staving off failure rather than trying to succeed (which apparently is a fault with the X-COM boardgame). I hit the mid stride and then the RNG gods started laughing at me. I was rolling 4-6 die to attack and missing every single one, while the enemy was rolling aces. I went through at least 3 rounds of no progress on my side and the enemy finding more reinforcements. Things were looking grim. A couple of lucky rolls though, and some good timing of skill use and I was able to take out some threats to move forward. On my last turn, where I thought I had completed everything and was waiting for the clock to tick down, I drew a card that summoned 4 enemies. The way the game works is that enemies only attack after you activate, so even though they were on the board, they were just staring at me on my way to victory. Even with so many pieces, the game itself is pretty straightforward. It’s a little math heavy with the die rolls but the rest is pretty obvious to play through. This weekend I hope to have a solid session with my wife. She’s pretty good at picking things up on the fly and as long as I have the tough questions answered in my head, it should go smoothly. And of course, another few games with the eldest child are due. Seems my New Year’s resolution is working out. Its on baby! I’ll play a round with you.